If nothing interferes (the launch has been postponed twice already), SpaceX will launch the classified Zuma satellite from Cape Canaveral Pad 39A in the early hours (UT) of November 18. Zuma was originally scheduled for November 16, but was delayed a day to November 17, and then yet another day to November 18. The published Maritime Area Warnings give a window from 00:55 to 03:37 UT for the launch. 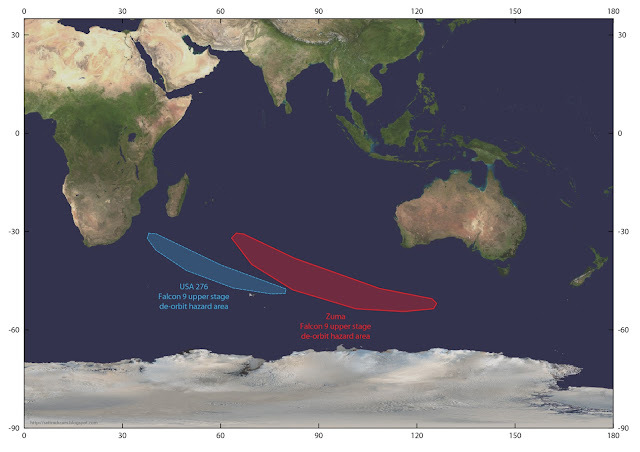 From the Area Warnings, the de-orbit of the Falcon 9 Upper stage happens some 2 hours after launch over the southern Indian Ocean, during the 2nd orbital revolution. The launch and Upper stage de-orbit hazard zones (I plotted them in red on the map above) strongly suggest a launch into a 50-degree inclined, ~400 km orbital altitude Low Earth Orbit. The map above plots the trajectory for the first ~1.5 revolutions in such an orbit. As can be seen in the map, such an orbit lines up well with the direction of the launch hazard zones, and with the Falcon 9 upper stage de-orbit hazard zone in the Indian Ocean. The fact that the first stage will return to the Cape for a landing argues for a launch into Low Earth Orbit too. 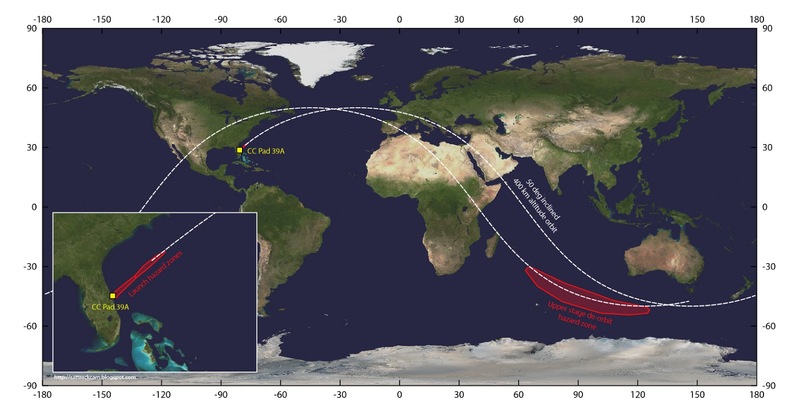 If a ~50-degree inclined, ~400 km altitude orbit sounds familiar to you: that is because this orbit would be very similar to that of the enigmatic classified satellite USA 276 which was launched - also by SpaceX - in May 2017. This is the one that made all those peculiar close approaches to the ISS in June (see some previous posts from June and my Space Review article here). Perhaps, but this is pure speculation based on suspected potential orbital similarities only, Zuma is up for a similar mission. It is very interesting that Zuma seems to have been contracted via a similar procedure as USA 276, and that like for USA 276, it has not been made public which Agency will operate the Zuma satellite. So there appear to be similarities from that aspect as well. It will therefore be interesting to see how the orbit of Zuma, once launched, compares to that of USA 276 and the ISS. 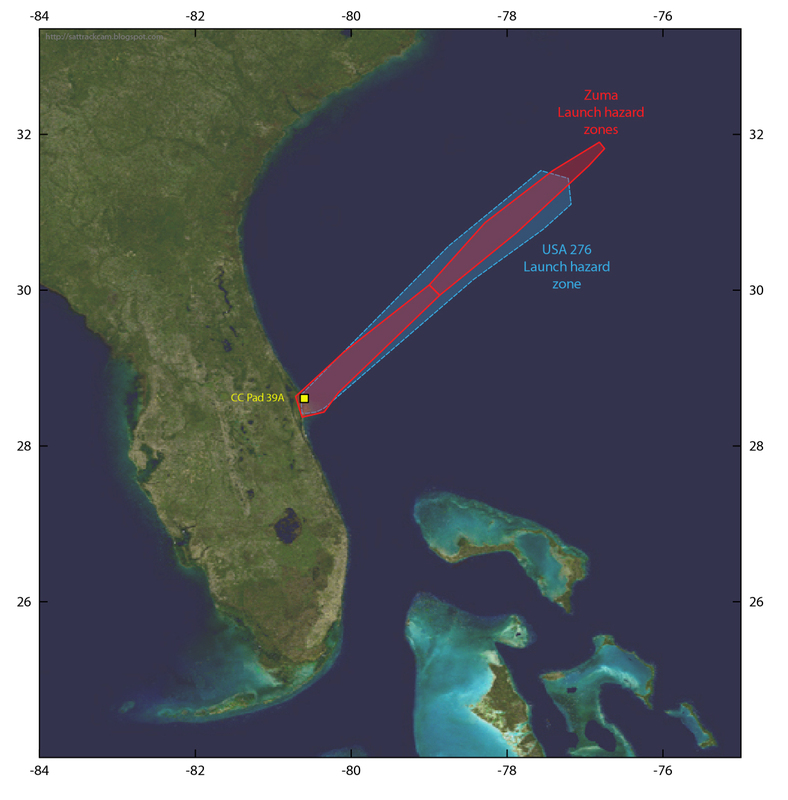 The orbital plane of the ISS will be overhead for Cape Canaveral near 2:38 UT on the 18th, so a launch exactly into the ISS orbital plane is possible - and will stay possible for several days to come in case the launch is postponed again (the moment of the ISS orbital plane passing over the Zuma launch site happens ~24 minutes earlier each day). On the 18th, the orbital plane of USA 276 will be overhead for Cape Canaveral some 10 minutes before the launch window opens. With the newest delay, a launch exactly into the orbital plane of USA 276 is therefore no longer feasible. But by launching directly at the opening of the launch window on the 18th, the orbits of Zuma and USA 276 would nevertheless still be quite close (launch at 1:00 UT would result in a difference in RAAN of 3 degrees), and differential rates of precession of the RAAN might still slowly drift the two orbits towards each other over the next weeks and months, depending on what the actual orbital altitude and inclination Zuma ends up in would be. Therefore a launch exactly into the orbital plane of either USA 276 or the ISS, strictly speaking is not necessary to engineer close approaches (indeed, USA 276 itself was not launched exactly into the ISS orbital plane in May). So it might be worth monitoring Zuma and its behaviour in relation to both USA 276 and the ISS in the weeks after launch. Still, it is also very well possible that Zuma has nothing to do with both spacecraft whatsoever. The maps below show a comparison of the hazard zones (from Maritime Area Warnings) for the launch of USA 276 in May 2017, and for Zuma. SpaceX has released a statement that, while not taking a launch tonight off the table, might indicate a further prolonged delay. These are the Area Warnings published for the launch. They are graphically depicted in the map in the top of this post and the two maps above. Authority: EASTERN RANGE 072156Z NOV 17. Authority: EASTERN RANGE 072155Z NOV 17.